This spectacular peak Pumori (7169m) falls in the Upper Khumbu region and is located surrounded by some of the world's famous mountains and most amazing scenery. Pumori is an unbelievable mountaineering option. The peak actually overlaps the Nepalese-Tibetan border. 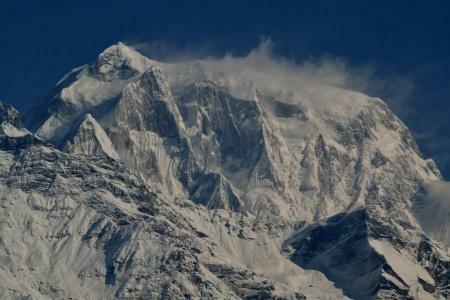 The trip is best fitting for strong, experienced mountaineer who want to add experience for mountaineering higher peaks. 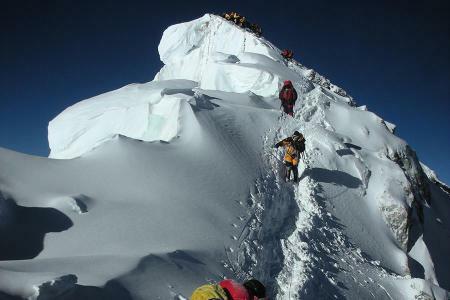 We take 9 days to reach at the summit of the Pumori Peak. To set our Camp I it takes 3 hrs walk after that you will have to walk 500m with the altitude around 35 to 65 degrees slopes. Pumori peak has many rocks and mixed ascend cross, vertical and exposed to airstream narrow edges, one tunnel climbs and some ice walls. We start from 6200m to reach to Camp II. It is located on a slim edge; so there is no terror of storms. We have an ice ascend of 400m and above 5000m we can see the ice walls, many crevasses etc. Talking about Camp III, it is too stormy. Lying at the elevation of 6850m, here you can observe Tibetan plateau; and you require rope here many ice walls and crevasses will come on the way to summit. 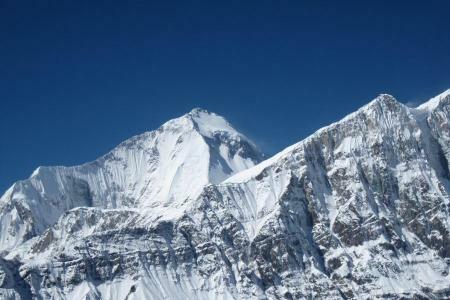 Subsequently there are two ascending ranges- Tibet side and Nepal side and between these sides Nepal side is much easier to reach to the summit of Mount Pumori. Unique Adventure is confident to offer 37-days Mt. 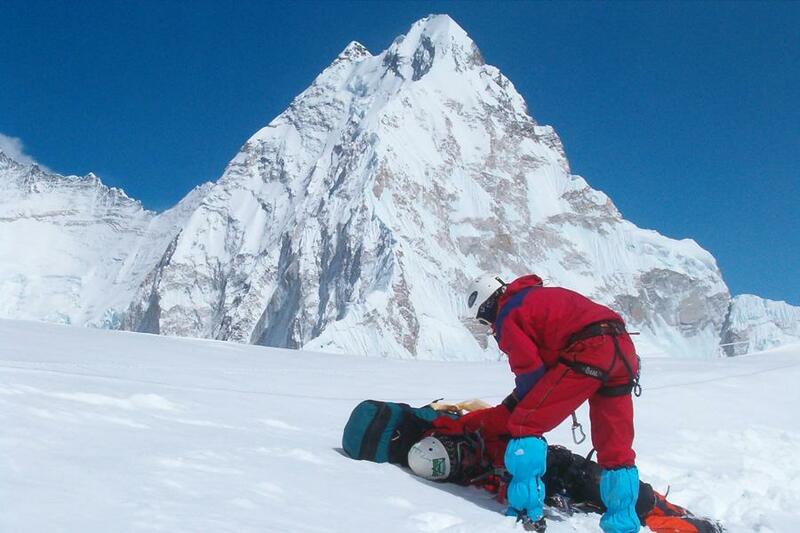 Pumori Expedition with the first-class service. Let us organize it for you. Passing all the way through Namche Bazaar which is the gateway to Mt. 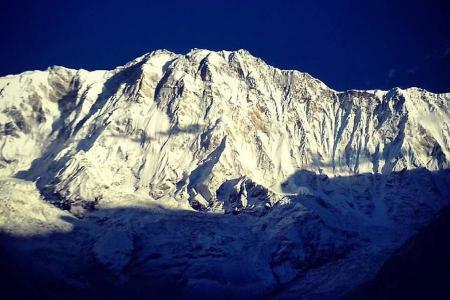 Everest; explore 200 years old Tengboche monastery, Pangboche monastery; and witness panoramic views of the dozens of peak and Tibetan plateau are the major fascinations of the Pumori Expedition. As soon as you arrive in Kathmandu, you will be welcomed and received by our representative at the Kathmandu International Airport and subsequently s/he will transfer you to the hotel. Rest of the day, you can either relax or go around as per your desire and overnight at hotel in Kathmandu. Day 02 - 04 : Stay in Kathmandu for the official procedure, overnight at hotel. Day 05 : Fly to Lukla and start trek to Phakding, overnight at guesthouse. Today we will take captivating flight from Kathmandu to Lukla (2827m) which takes around 40 minutes. From the flight, we will witness close views of enormous peaks connecting Nepal and Tibet. We will arrive at Lukla in the afternoon and we begin walking downward to the Dudh Koshi River and take up the major way that leads to Namche Bazaar which is located just above Chaunrikharka (2713m). The path is trouble-free and after passing the tiny village of Ghat (2550m) we take a short walk to Phakding. Overnight in Phakding. Day 06 : Trek to Namche Bazaar, overnight at guesthouse. Day 07 : Rest at Namche Bazaar for acclimatization, overnight at guesthouse. Day 08 : Trek to Pangboche, overnight at guesthouse. Today our track moves on from Namche Bazaar to Pangboche. On the way, while ascending you will witness the perfect view of world highest peak- Mt. Everest, Mt. Nuptse, Mt. Lhotse, Mt. Amadablam, Mt. Thamserku and other several huge mountains which will thrill and excite you. Overnight at guesthouse. Day 09 : Trek to Dingboche, overnight at guesthouse. The path moves down to Debouche which come across the suspension bridge over the Imja Khola and ascends to Pangboche between thousands of Mani stones. We can spot huge view of Ama Dablam and the path up to the upstream nearer to Imja River rather moderate up to Imja valley. Now the way move to Dingboche, the Sherpa settlement with the eye-catching field. We stay at guesthouse at night. Day 10 : Trek to Lobuche, overnight at guesthouse. High climb starts at 5,300m; which is next to a stunning small lake from where you can get a stunning sight of Mt. 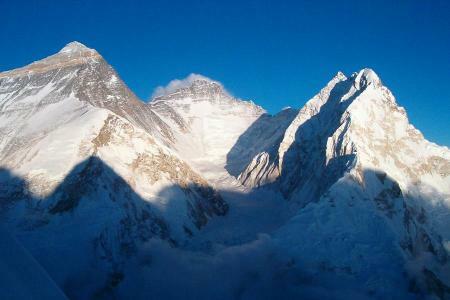 Everest and Kalapthar at 5545m. Overnight at the tented camp. Day 12-21 : Climbing Period. We take 9 days to reach at the summit of the Pulmore Peak. To set our Camp I it takes 3 hrs walk after that you will have to walk 500m with the altitude around 35 to 65 degrees slopes. Pumori peak has many rocks and mixed ascend cross, vertical and exposed to airstream narrow edges, one tunnel climbs and some ice walls. We start from 6200m to reach to Camp II. It is located on a slim edge; so there is no terror of storms. We have an ice ascend of 400m and above 5000m we can see the ice walls, many crevasses etc. Talking about Camp III, it is too stormy. Lying at the elevation of 6850m, here you can observe Tibetan plateau; and you require rope here many ice walls and crevasses will come on the way to summit. 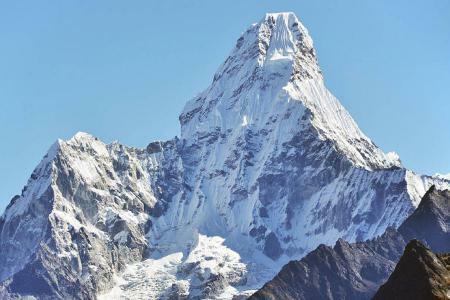 Subsequently there are two ascending ranges- Tibet side and Nepal side and between these sides Nepal side is much easier to reach to the summit of Mount Pumori. Day 32 : Trek to Pangboche, overnight at guesthouse. Day 33 : Trek to Namche Bazaar, overnight at guesthouse. Our route continuously moves back to the town of Namche Bazaar (3441m). And then reach to Namche Bazaar. Overnight at guesthouse. Day 34 : Trek to Lukla, overnight at guesthouse. Today, we return back to Lukla and see different Sherpa villages while crossing a suspension bridge over Thado Kosh. Overnight at guesthouse. Day 35 : Fly back to Katmandu, overnight at hotel. On this day, we wake up early in the morning to take the flight for retracing back to Kathmandu. On arrival in Kathmandu we will transfer to the hotel. Day 36 : Leisure day in Kathmandu, overnight at hotel. Today you have a rest day in Kathmandu. Or, alternatively explore around Kathmandu valley which includes visit around historical and spiritual attractions; including Durbar Square, Bauddhanath; one of the largest stupas in Nepal, Swayambhunath; top on the hill in the city knows as the Monkey Temple, Pashupatinath; Hindus holy place. Stay overnight at hotel in Kathmandu. Day 37 : Transfer to airport, departure on your own destination. Our airport representative will shift you to the airport from the hotel for your way back to home country.